Reliable party rental company since 1985. We give your events a personality and a unique flair. Wow your guests with a beautiful set-up complete with tents and other party rentals no matter the occasion. There are so many things to celebrate in life! From the very beginning to welcoming a new baby into the world with a beautiful baptism or another religious celebration. Once your baby grows up, throw them a big outdoor party with bouncy castles and plenty of games. 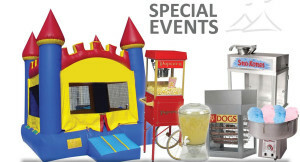 For later years, turn it up a notch by planning a themed event fit with cotton candy and popcorn machines, concession stands and other carnival activities! Simply put, there are plenty of ways to celebrate and make life a party! Weddings and anniversaries are huge life celebrations that deserve a whole day to themselves. Create a beautiful space for your guests to enjoy food and conversation under party tents. You can designate special areas for activities under each tent to give your guests an unforgettable experience full of fun and excitement. Tents will also protect everyone from bright sun or any unwanted weather elements. Hosting a private event for close friends and family? With The Party Centre’s rentals, you can build the privacy you desire and ensure everyone enjoys quality time with one other. Whether it’s a Thanksgiving dinner, religious celebration or a Christmas tradition, we’ve got you covered. Our selection of party equipment is vast, consisting of tables, chairs, dinnerware, flatware, glassware, and cooking equipment. Let’s make your next big or small event hassle-free so you can focus on making lasting memories. Snacks at work are great but what your employees and customers remember is how you made them feel. Employee appreciations days can quickly become your event of the year with fun activities, catering, and audiovisual equipment to take it up a notch. To show your gratitude to your clients, host an extravagant gala with a red carpet and performances. Your customers will appreciate the effort you put in and never forget a night of fun planned just for them! A great event is made better with great décor! Your guests will enjoy themselves as the conversation, food and drinks flow, but they’ll also notice the extra mile you went to get perfectly themed tables and chairs, among other stunning features and décor. With our wide variety of different coloured linens, furniture, and dinnerware available, you can plan your event with us no matter how casual or formal the theme is. Whether you’re planning a formal wedding or a more casual event, we have the tent for you! We carry many banquet items including but not limited to chafing dishes, trays, bowls and cake stands. Concessions are a great way to add that fun and festive atmosphere to your event. Choose from our popcorn, Sno-Kone, Candy floss and hot dog machines. We also carry a full line of concession supplies. 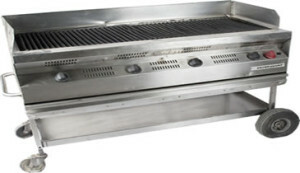 Check out our various BBQs along with other cooking equipment such as soup kettles and coffee percolators. Sharpen the look of your trade show, meeting, conference or seminar by renting essentials like a red carpet. In addition, beautify your event with our new event decor items. We’ve got you covered! An extensive in-house inventory, including but not limited to marquee tents, tables, chairs, special event and party rental equipment will help ensure that your event is a success. Whether you are planning a trade show or a wedding or a birthday party we have the quality products to choose from, all under one roof. We recognize that you want your event to be fabulous and we are also aware that everyone is on a budget. We will work with you to offer the best event rental solutions. We are competitively priced and you can be rest assured that you will get good value for your money. From time to time we also run promotions so do sign up with us so we can keep you informed about any ongoing promotions. Whether you are organizing a personal party or a corporate event our courteous, helpful and knowledgeable staff, simplify your event planning process. Visit our showroom and we will sit with you and listen to your requirements and offer suggestions. Call us if you are not able to visit and we will give you the time over the phone to assist you. Either way, you are always welcome at The Party Centre! 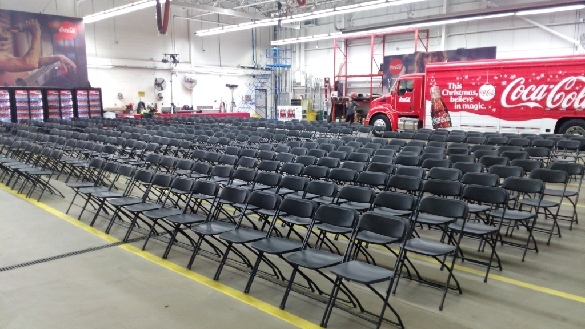 The Party Centre has been serving Greater Toronto Area since 1985. Providing special event and tent rental services to large corporations, festivals and residential clients has allowed us to gain tremendous industry experience over the years. Whether you are planning a simple intimate gathering for a few or organizing a large festival for thousands, we can assist you in selecting the most suitable of enclosures and equipment, making your event a truly special one. I have worked with The Party Centre for a variety of events that I have planned. They offer a range of rentals for any party occasion, along with a lot of colour options for linens, etc as well. I have always been happy with the professional and friendly service I have received! Expecting a crowd of over 5000 people, for a spring carnival, we needed to rent concession machines for the kids.We received excellent service and were given thorough instructions on how to operate each machine safely. As an event planner, I definitely recommend The Party Centre to anyone looking for quality machines at a great price!